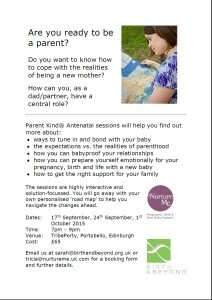 Thrilled to be bringing to you with, Sarah from Birth and Beyond, Parent Kind Antenatal Sessions. These are the first type of classes in Edinburgh looking solely at the emotional preparation of being a new parent. The sessions are highly interactive and solution-focussed. You will go away with your own personalised ‘road map’ to help you navigate the changes ahead. Email us at sarah@birthandbeyond.org.uk or tricia@nurtureme.uk.com for a booking form and further details.